We're not sure why we have a pathological hatred of webcams, but if we're not ripping them apart, then we're trying to permanently epoxy them to other things. Our latest endeavour came about after another trawl of the bargain aisles at the local eBay when we stumbled across a cheap microscope. It struck us that it'd be perfectly possible to capture images from the microscope onto the bare face of a webcam's detector. All that's needed is a contraption to mount the webcam in the right place over the microscope's eyepiece. Beyond that it'd be just a case of focusing the image onto the webcam's detector just as you'd focus it onto your retina. It sounds simple enough: find a suitable section of tubing, cut a slot to take the webcam's innards, line it up correctly and fix the whole thing in place. The best bit about this build is that it works beautifully. 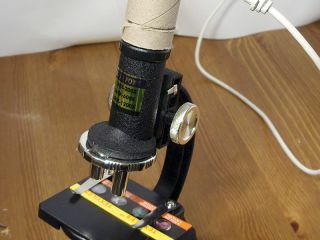 Old microscopes can be picked up for as little as £10, while most people have an old webcam, or else again these can be picked up for peanuts online. These are great things to play with as you can easily watch organisms grow in ordinary tap water or just examine slices of plants or vegetables. It's perfect for projects and if connected to your PC you can record videos. Future Publishing Limited provides the information for this project in good faith and makes no representations as to its completeness or accuracy. Individuals carrying out the instructions in this project do so at their own risk and must exercise their independent judgment in determining the appropriateness of parts, equipment, sealants and other adhesives for a particular use. Protective clothing, gloves and goggles/safety glasses should also be worn at all times, when using drills. Use of the USB microscope may void a product's warranty. To the fullest extent permitted by law, Future Publishing Limited takes no responsibility for any person relying on the information relating to this project and disclaims all liability for any errors, omissions, damage or injury to users or their equipment as a result of or relating to their making and use of the USB microscope.